The 6.5 Grendel vs 6.8 SPC debate can get ugly. However, I’m not out to bash either of them because there’s ZERO reason to. They are both Fantastic cartridges that allow the AR-15 to perform FAR beyond what it was originally designed for. So I’m going to explain the differences between them WITHOUT any childish “my cartridge can beat your cartridge” talk. Then I’m going to explain why it doesn’t matter as much as everyone thinks it does. First of all, The VAST majority of us don’t reload. As such I’m going to limit myself to factory ammo only. Before 6.8 fans cry foul because of the 6.8 SPCII chamber, remember that the Grendel II chamber exists, and has the exact same amount of performance increase over the original Grendel. I‘m comparing factory ammo only and basing performance on that. If you don’t know what Sectional Density is, I HIGHLY recommend reading My article on Sectional Density before continuing. Now that’s out of the way. 6.5 Grendel wins in Sectional Density. 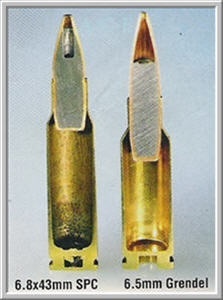 The 6.8mm bullet is larger than the 6.5mm bullet. There’s no getting around that. Neither cartridge does it’s best with heavier bullets though, and here’s why. Notice how far the bullets stick into the case? Heavier bullets are even longer, and longer bullets mean less space for gunpowder. That means lower bullet velocities. The 6.5 Grendel gets the optimum balance of velocity to bullet weight at around 100- 123 grains. The 6.8 hits this balance in the 100-120 grain range. 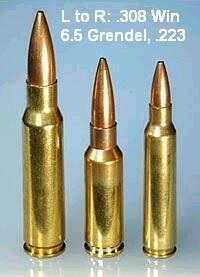 The Grendel can do 123gr bullet Bullets with a Sectional Density of .252. The 6.8 SPC highest is .223 with 120gr bullet. Higher Sectional Densities mean more aerodynamic bullets. Fortunately, Hornady produces both the 6.5 Grendel and 6.8 SPC in their SST bullet (accurate, low drag hunting ammo) so we can compare them “apples-to-apples“. 123 Grains for the Grendel, 120 Grains for the SPC. Both velocities are out of 16” barrels. The 6.8 starts out 100 FPS faster. They’re almost identical at 250 Yards, and the Grendel is 100 FPS faster at 500 yards. Otherwise, until about 500-600 yards, they’re isn’t much difference. Thanks to it’s more aerodynamic bullet, The Grendel and SPC are neck and neck for a long way even with the 6.8 SPC starting 100 FPS faster. For those who love the SSA 140 grain 6.8 SPC loading, let’s match it up against the 129 Long Range Accubond out of a 6.5 Grendel (available here) I’m assuming 24″ barrels on both. Inside common hunting range there is ZERO effective difference. If you want a Tactical Cartridge, things don’t really change because there’s ZERO effective difference in lethality. The only real differences show up at longer ranges. The Grendel drops less and more importantly, the Grendel Drifts less in the wind. The 6.5 Grendel drifts 6-7 inches less at 500 yards depending on barrel length. Not a lot, but it might be the difference between a hit and a miss. The 6.5 Grendel drifts up to 19 inches less at 750 yards. That’s a huge difference in ability to land shots at long range. Granted, that’s a long way and most soldiers couldn’t hit an enemy at that range. It doesn’t matter how you slice it, beyond 500 yards the Grendel has an advantage because it’s going faster, drops less and drifts less in the wind. That’s inherent in high sectional density bullets: they are more aerodynamic. However, the differences don’t show up until 400-500 yards, and they aren’t large. Which brings me to part everyone misses. Neither animals nor enemy soldiers can read the headstamp on your brass. Both combat and hunting are about the same thing: Accuracy. You can’t miss fast enough to win a gunfight or fill a hunting tag. That’s why I like the Grendel better. The 6.5 Grendel isn’t more accurate than the 6.8 SPC. They are both VERY accurate cartridges. However, the long, high Sectional density 6.5 mm bullets ignore the wind better and retain velocity better. Less wind drift = better shot placement at long range. The 6.8 is no slouch, but 6.8mm bullets can’t buck the wind like 6.5mm bullets because the 6.5mm bullets have a higher sectional density. Another huge component of accuracy is practice. Here the Grendel also has an advantage in cost of ammo. As I write this in October of 2015, the cheapest 6.8 SPC ammo is around $0.75/round. That’s for just plain old FMJ, which is best for punching paper because it’s not effective for hunting or combat. You can buy Grendel Ammo for only $0.28/round. A little math tells me that 6.8 SPC is almost 3 times more expensive than Grendel. Plus, that $0.28/round Grendel ammo is Wolf’s 100 grain “military classic”, which is constructed like the infamously lethal 7N6 bullet. It’s deadly stuff. Your ACCURACY matters WAY more than the cartridge you pick. I would suggest working on your accuracy because You can’t miss fast enough to win a gunfight or fill a hunting tag. P.S. To the Grendel and SPC Fanboys: Girls you’re both pretty. Now can you stop bickering and move along? you gave me just the info I wanted, with no BS and Ballistic data to back it up. This offically pushes me to the 6.5 so long as I can source ammo or reloading equipment. I know it’s a older article but I just wanted to say thanks for telling it like it is. Thanks. 🙂 Also, everyone is welcome to comment on any article here, regardless of how old it is. I went with 300 blk on my alternate build, but I think on the next one it’s 6.5. Thanks for the article. Your figures are are off by quite a bit by my own testing with the Hornady 120SST factory load. Velocities confirmed with two different chronograph. So with those numbers what would you surmise the 24″ barrel velocities to be considering my 20″ barrel is quite easily surpassing you 24″ estimate. They are both great rounds and if I was looking for a pure paper puncher I would most likely go with the Grendel and keep my loads mild enough as to not have to worry about breakage. But I use my rifles for hunting and am quite impressed with the 68SPC for that purpose with either spec I or spec II loads as long as it isn’t Remington factory ammo. Ammo availability and selection in my area is another key issue for me with factory ammo I can always find Hornady 68SPC on the shelf. Okay, using your numbers my basic point changes very little. The two cartridges are more alike than different. The Grendel and SPC both throw similar weight bullets at similar velocities. The SPC starts faster, the Grendel keeps it’s speed better and drifts less in the wind. Giving the SPC a little more velocity only makes the two rounds even for longer. Let’s guess the 24″ SPC gets 2700 FPS with the 120 SST out of your barrel. (120 FPS faster than the Grendel, about the same difference as with the 16″ barrels) They’re still pretty even until about 500-600 yards. The 6.8 SPC is a GREAT hunting cartridge, and the 6.5 Grendel is too. Again, they’re more alike than different inside 400-600 yards. ABE, your info is great for me. I have a .223/556, 6.5 Grendel, 6.8SPC, 300 BO last year before the Grendel, 450 Bashmaster (thumper), and a S&W M&P10 in .308. I just finished the 6.5 Grendel, have not shot it yet, will be soon, going hog hunting in FL the end of March. Built the .300 BO last early fall. Shoots great, no recoil to speak of, but I’m putting muzzle brakes on all my ar’s except the MP10, no threaded bbl at this time. 2 yrs. ago I shot a 187 lb. hog with my 6.8 SPC. Went right thru his Rt. shoulder with 115 gr. bullet at 75 yds, smashes his should, no exit pt., but took him right down. The 6.8 is one fantastic cartridge. I was concerned which cal. to use, 6.5. or 6.8. From your article I decided on my last build, 6.5 G. I’m 72 yo and am somewhat recoil sensitive due to 2 bad shoulders from doing heavy weight training in my 20’s to 50’s. There is probably little difference in recoil between the 6.5. And 6.8. The MP10 has not been used yet,. And the .450 bushmaster kicks like hell. Got to close on the optics, Red dot with 5 power magnification and got a big kiss on my left eyebrow from snuggling too close. Abe your info helped me out tremendously. These are running in the 2830 fps range with 34.4 Grains of LEVER. The Grendel cannot touch them. Do the math on that. When you put hand loads into the equation the 6.8 moves up a lot over factory ammo. This is why you never see the comparison done with hand loads to hands loads between the 2 cartridges. That is a potent loading. Do you know what pressure it’s running at? I ask because I’ve seen lower 6.8 SPCII velocities being called very hot handloads. He’s faster than my 22″ .260 Rem with 130gr Berger VLD, and I’m using way more powder than that, at or slightly over the edge of working pressure for .260 Rem, which is higher than 6.8 SPC. …or is a brave hand loader with promising results on the chronograph outweighing safety. Even if the velocity is true, accuracy is usually always lost when you come out with your hair on fire. What is gained by a screaming round that can’t hit anything? Interesting article. Based on what I know about the 6.8, its more similar to the 6.5 Grendel than most know. Both are great cartridges IMO. But for hunting, the 6.8 is the better choice due to the shorter barrel length as mentioned on your article. The 6.5 Grendel can also be hard on bolts too. And that FMJ ammo you’re were talking about, I’ve seen it as cheap as $9.99 a box. For punching paper at distance, I’d probably pick the Grendel over the 6.8. Or even better, one of the newer 6.8 Wildcats or a 270AR. But those are Wildcat cartridges for now. Excellent point. If the only point of your rifle is hunting/ plinking, the 6.8 is a much better option, especially since ammo is much cheaper to find in stores. 6.5 Grendel can still be scarce on the shelf. I chose 6.5 Grendel over 6.8 because I wanted it for hogs/coyotes/deer/antelope, but I also wanted a round that I could start long range shooting with (I also have a .308, but I don’t like it for target practice (savage) because it is light and kicks like a mule), and the 6.5 won out over 6.8 there. Nice article with practical advice. Liked the technical considerations you provided for powder capacities, chamber pressures, chamber design, factory vs hand loads, etc. One, non-technical term was mentioned a couple of times when discussing wind drift. No bullet “bucks the wind.” More aerodynamic bullets produce less drag and lose less velocity during flight. 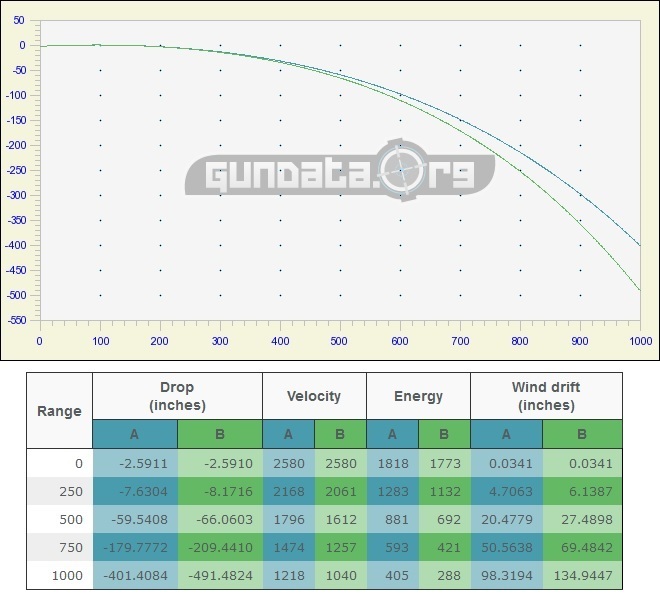 Less wind drift by a bullet is due to less time in flight due to a higher average velocity for the flight. It’s true that “bucks the wind” is an entirely slang term with no real world meaning. However, bringing up Form Factors, G7 vs G1 drag profiles, and flight time was beyond the scope of the article (no pun intended) so I used slang. Well, Abe. It was time for me to go back to “school.” You are absolutely correct. Bullet aerodynamics are what matters unless flight times are significantly different. I was severely over-simplifying the phenomenon of bullet flight in moving air. I had to dust off a couple of my engineering textbooks but it was worth it. I have a whole new appreciation for long distance shooting. One point your article does not mention, and I only bring this up because it’s somewhat important only in self defense scenarios, is that the design of the 6.5G cartridge causes a higher rate of feeding malfunctions. Keep in mind the guys who came up with 6.8 tested 6.5 but discarded it “due to reliability concerns” which may have also included the bolt issue with 6.5G. If you are a long range shooter than by all means 6.5G is the better cartridge. But I am a firm believer that for 0-500 encounters with human opponents, 6.8 is the bullet I want in my rifle’s chamber. I still have about 120 rounds of the 140 grain Bergers too. Do you have a credible source for the Grendel feeding problems? I’ve heard that objection many times but haven’t found solid evidence for it. Also, the 6.8 SPC and the 6.5 Grendel were both introduced at the 2004 SHOT show. Given that, how could the 6.8 designers reject the Grendel design if they didn’t know about it? Personally, the only problem i have in my 6.5 Grendel (AR stoner mag, 25 rd.) is the very last bullet. Everything else feeds fine. Incorrect. 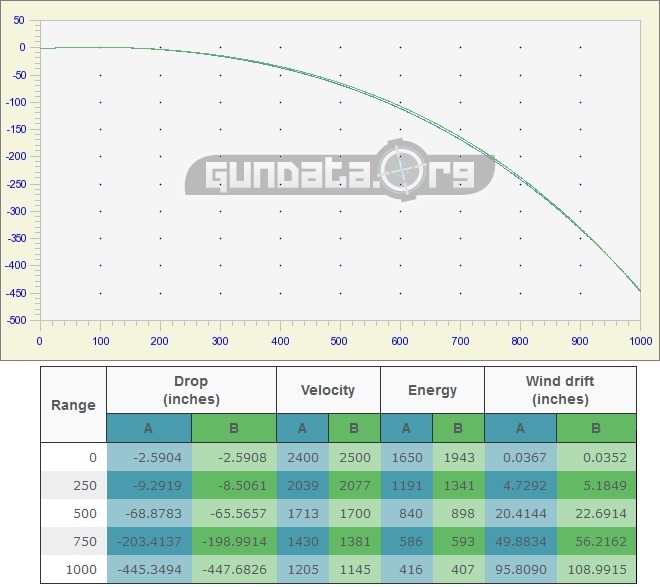 The guys who concocted the 6.8 thought there was some terminal performance advantage to a bullet with a .007″ larger diameter, with lower impact speed and less chance of hit potential. They were offered professional assistance at the AMU, but refused it, and chose one of the worst bullet diameters possible for the case length of the SPC. This is the first I’ve heard someone pull that argument out of the air, and I’ve been following the program from the start before it was even known to civilians, to include assistance with assembly of some of the original uppers, before they even had a 6.8 magazine, where we were told that it ran fine using 5.56 mags with a different follower. That proved to be bogus, with all sorts of malfunctions, indicative of a low-rate, unprofessional program of marketing to military units, with no testing to back up their claims. Within 500 yards, a shorter barrel Grendel has higher hit potential than the 6.8 all day long, due to BC. Within 175yds using the same barrel length, 120gr SST vs. 123gr SST, there is more retained energy and impact speed with 6.5 Grendel, but not much practical difference. Within 250yds, the 6.5 Grendel SBR still is within PBZ, whereas the 6.8 is not because of wind drift. Incorrect. Read (among others) this paper: http://www.dlgunsmithing.com/uploads/4/5/8/2/45825609/wound_ballistics_2013_gary_roberts.pdf. Why this professional work is over looked or disregarded is beyond me. It has been proven with professional/scientific evaluation, that the 6.8 SPC is the better all around cartridge. For what it was intended to replace, it does quite nicely. Much of your arguments are based on distances that most troops cannot take advantage of, even with good optics. Try 6.5 Grendel out of a 14″ barrel and let me know what you come up with. I would prefer 6.5 Creedmoor over the 6.5G. GREAT RESOURCE! 🙂 I just read through it and it’ll make a great addition to my collection of gun papers. Question though: where is the professional/scientific proof that 6.8 is better? The paper doesn’t even mention Grendel (though it does a great job of highlighting the 6.8) Do you have a link to this proof? Because like I said, they’re more alike than different inside 400-600 yards. Interesting article. For sure the 6.8 was purpose built for a shorter barrel, the 6.5 for a longer barrel. Putting a longer barrel on the 6.8 regardless of bullet weight won’t recover the difference in BC. Example the Hornady 120/123 bullets the 6.5 has a BC of .510 the 6.8 .400. Big difference which manifests itself like you said in the 300-600 range. For handloading with a properly headspaced and matched bolt/barrel assuming my magazines will allowing longer OAL of the cartridge I still like the 6.8. My barrel is a ARP 20″ with 6.8 ARP chamber (similar to Wylde) allowing for for customizing of the load and OAL (all subject to ability to fit into the magazine. With those variables I think you’ll find the 6.8 to be about dead even with the 6.5. Farther out and I’m .338 Lapua with its HUGE BC 600-2000. Zzzzt! Nomenclature of the charts above throws everything into question. 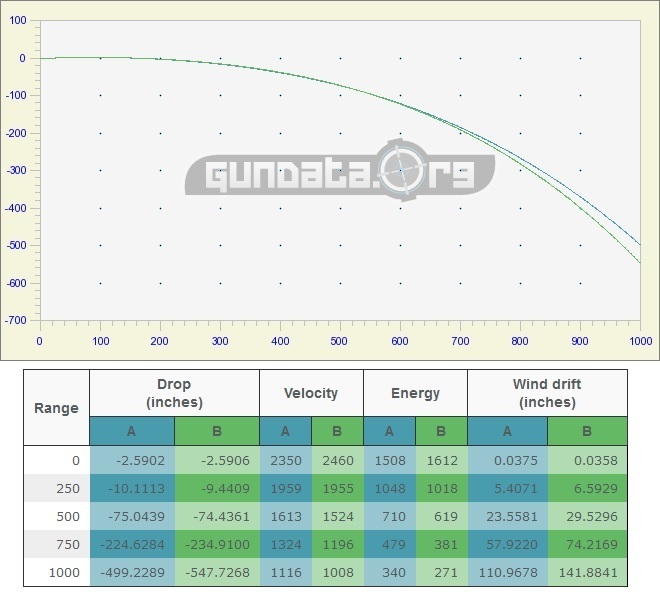 First, the bullet “drop” normally refers to the actual drop of the bullet from the muzzle downward over distances in charts, and “path” is the position of the bullet above and below the ZERO point (2nd line of intersection between a straight line out of the barrel and the bullet arc). Are you zeroing at 100, 200, or what in this chart? Clearly the chart must mean PATH not DROP. And obviously there is NO DROP at the muzzle! Now, a 120gr SST launched at 2460fps yields a DROP of 100″ at 500 yards, at sea level, 70 degrees F, 29.85″ barometric pressure, not the 74″specified here. Zeroed for 200 yards, it has a 64″ drop, so clearly it is referring to the PATH based on some intermediate ZERO distance. OR it’s just 26″ off in it’s calculations. Drift in a 90 degree 5MPH wind is 14″. Where did 22″ come from?? Mine are based on Nikon’s ballistic program. Also though it might be the same for both cartridges, what it the wind speed?? Not specified anywhere I can see. So anything other that the relative velocities vs. energy in these charts are suspect and should be double checked by the reader. Velocity vs energy disregarding distances, etc., seem to be about right. I won’t go into the other holes (pun noted) I see here. There is drop at the muzzle. I encourage you to take a look at Hornady’s website. https://www.hornady.com/ammunition/rifle/6.8mm-spc-110-gr-v-max-black#!/ manufactuer spec. I can’t tell you the scientific reason *without google* , but I can sure guess. My guess is the bullet has an aggressive enough spin on it in an attempt to stabilize the bullet that within that 0-50 or 0-75 yards before we hit 100 the bullet is being pulled down by gravity and the downforce of the spin. Then the aerodynamics of the boat tail at that velocity bring the bullet back up in that un-measured range. All of these cartridge limitations are based on the assumption that we are limited to an AR15 platform. Okay, fair enough. ARs are fun, no doubt. But one should first ask why establish that limit? Because of weight? Because they’ll carry 20 rounds? You don’t need a mag larger than 5 rounds for hunting. Human wave attacks, and battles well that’s another story. It seems that people are looking for a “one size fits all” solution. Small light weapon, little recoil, able to take on 20 humans at a time, or kill an elk at 400 yards. Seems like nonsense to me to ask one cartridge to fill all these roles. One autoloader solution I have for hunting is a BAR in 270 Win. Good out to 500 yards with authority, semi auto 4+1, heavier and longer than an AR15, but not so burdensome that I can’t hike 10 miles / day in the mountains with it and a backpack, and I’m over 60 y/o. Shoots cloverleaves with handloads @100 yards. 130gr SSTs or TTSXs, 2940fps. But indeed I’m interested in a 6.5G for target shooting and hunting out to 200 yards of wild pigs. Remember, you want some margin for error in the form of power when hunting unless you limit yourself to close enough ranges to guarantee head or neck/spine shots. Authoritative anchoring is important in my book. Just my H.O. For me, the benefit is once I go through the legality of owning an AR lower, I can simply change the upper receiver and I have a zombie gun, a range gun or even a hunting gun all in one platform. That is something you cannot do with a BAR. Same as Tim. I can have multiple calibers, in one platform. One gun case at the range, 3 uppers, 3 setups. 5.56, 6.5, (and if you hate your lower receiver) .458 socom. One point you seem to gloss over is fact that different barrels (twist) don’t necessarily favor the same bullet weight. My 6.8 Rem gives sub MOA with 110 grain bullets. With heavier weight bullets the groups open up to 3+” at 100 yd. One of the most overlooked aspects of shooting, hunting, and charts is wind drift. We really don’t focus as much on drop, because we are going to use some common method to compensate for drop. Even within common hunting distances, you will find that wind drift is your main determining factor in point blank zero (PBZ). That’s where we hand the rifle to our wife, nephew, niece, uncle, etc., and tell them to aim right behind the deer’s shoulder, and slowly pull the trigger straight, back, to the rear with the crosshairs/red dot aligned with the vitals. With a 200yd zero, drop within 400yds is very similar, but drift limits the lower BC projectile to a shorter PBZ, while also increasing the likelihood of a miss of the vitals with a wind shift. Chambers: There was and is no deficiency with the 6.5 Grendel SAAMI chamber. That is an incorrect statement peddled by PTG reamers, so he doesn’t have to worry about holding himself and his monkey shop to industry standards. Once he convinces you that he has a better reamer design, he can now send you whatever he likes, with no way of most shops being able to verify, so don’t fall into that trap. 6.5 Grendel SAAMI chamber works extremely well, and is one of the only chambers I know of that shoots different bullet shapes the way it does into MOA or less. Normally, rifles I have had custom built are throated for one specific ogive shape, usually some kind of VLD or secant ogive bullet that I will stick to in that gun. With 6.5 Grendel, both tangent and secant ogive bullets shoot equally well. Another big difference between 6.5 Grendel and 6.8 is twist rate. 6.8 simply does not as tight of a twist, and RPM on terminal performance is beneficial to nose deformation, rapid expansion, and multiple helical wound cavities within the same length of penetration space. So even within 200yds, you get more speed on contact with the tissue or barrier, less deflection, more penetration, more wound cavity helix within the medium, and more likely hit through the intended aiming point (POA). For the guy pushing his 22″ 6.8 to 2830fps with a 130gr, that’s faster than a 22″ .260 Remington or 6.5 Creedmoor, both of which operate at higher working pressures than the 6.8, with way more case capacity. Something doesn’t add up there. Shorter barrels? 6.5 Grendel is still superior in every parameter you can measure, despite what has been claimed. People just don’t have a basic understanding of physics, so they have to rely on other uneducated people to form their opinions for them, which are incorrect. Both of these cartridges were designed for very different purpose. They are NOT and apples to apples comparison, as you try to portray above. The 6.8mm was specifically designed as a system that would not lose much if any velocity therefore range from barrels under 16″ down to 10″. Even the 8.5″ PSD can still be effective out to 300m due to this design. The 6.5 on the other hand was made specifically for long range shots out of an AR-15 system, with long barrels, for precision shots out to 1000m. What the 6.5 possesses in long range, it loses when used in super short barrels. These are two completely different tools, that you should pick depending on mission requirements. I went with 6.8 because I wanted a 10.5″ barrel that would still be lethal to around 450m. I would pick a 6.5 if I wanted a DMR style rifle with long barrel to make long range shots. You are right about one thing at the end, both cartridges are very attractive, but one out shines the other, only depending on your usage. I’ve been very enraptured with the 6.5 caliber ever since I bought a Swedish Mauser chambered in 6.5×55. it is, in my honest opinion, the most accurate bullet diameter out there. I really enjoyed your article. I’m about to start building a new AR and I’d been debating between 300 blackout, 6.8, and 6.5. Hoping to make a dual function hunting and target rifle. Jeez my brain hurts now ! I am an average joe that just wants to hunt blacktail, muleys and porkers with a AR platform (DS Arms lower).backed with a RockRiver 2 stage trigger and currently sporting a Fulton Armory 20″ match grade bull barrel. This is my bench set up. Mag capacity cant be more than 10 rounds any way so that issue is mute. I will buy new mags anyway. You Gentlemen seem very honest and knowledgeable so which caliber would be recomended ? I reload for my bolt guns so ammo availability is not an issue but I am justa novice. Looking in the range of 5-600 $ maybe a bit more. Sooooo… all input is appreciated. Going complete upper so I can hold only one outfit responsible for warranty, etc. For practical hunting ranges: either. BC of bullets doesnt much matter at 0-300 yards. I don’t use poor accuracy, steel ammo, so the $0.28 figure is a non-starter. Lets say you shoot 500 rounds of ammo and have a pile of brass now. Maybe you’d like to have accurate ammo. To shoot the 500 6.8’s cost you $25. The 500 6.5’s cost you $175. 500 once-fired brass will last a long time for hunting and accu- plinking. Even if you don’t reload, and just sell your once-fired 6.8 brass, you come out ahead over shooting steel 6.5. The 6.5 has the long-range ballistics, the 6.8 has economics, and is on par for practical hunting ranges. I did appraisals for buying when I managed a gun shop and those numbers just aren’t right. There’s a thread on the 6.8 Forums about the price of once-fired brass shipped. The Remington brass you’re talking about averaged $0.32/each over the last several years. And that’s to buy, not sell. Also, Remington was the cheapest of them. Selling you’d need to go to Gunbroker (or a forum) to sell directly to someone else. There are currently 74 search results for “6.8 spc brass fired” on Gunbroker.com in the completed listings section. Only four of them sold. The average selling price for those four auctions $0.26/each. Any serious hunting or target work will be done with premium bullets that cost around $1/round anyway. So If I’m just plinking anyway, what’s wrong with much less expensive but slightly inaccurate Steel case ammo? All of that said, either will get the job done just fine inside 300 yards if you get a good bullet and put it through the boiler room. so, not a fan of 6.8 myself because of what it was designed for, and lacks in design vs. 6.5. That being said, for your purpose, 6.8 spc. I live in a place where I can go shoot and have 2 miles of open range in front of me. (Public land, Cimarron national grasslands). My 6.5 G is for animals AND long range. 6.8 is easier to find in stores, and because of lower energy from a 120 gr. sst Hornady bullet, maybe more practical at your ranges than a 6.5. You did a fine job in a difficult comparison. The only criticism of size I have is on the chamber premise. Even at 2016 when this was written, you were hard pressed to find a 6.8 SPC or 6.5 Grendel (alternate chamberings) in current “new products.” I do agree that factory ammo vs hand loading is significant variable. However these being, perhaps somewhere between wildcats and mainstream, I suspect a greater number of shooters of either caliber are hand loading them. And therefor, the comparison must be taken with a grain of salt. And I don’t want to get in the weeds over non-SAAMI ballistics – despite ballistics being the core of shooting. Like a surgeon – the job is more than just getting him to the operating room, he has to perform when he gets there. My personal opinion having done a great deal of study over the last 3 years is that the choice is fairly cut and dried – at least for me as a hunter. You can rack your brain dealing with the subtitles but unless you mainly shoot 300+ yards, the Grendel has nothing to offer over the 6.8 SPC. And it does this (as does the 7.62×39 and various PPC derivatives) at increased bolt breakage potential in AR platforms over the 6.8 SPC. To the plus for the 6.5 Grendel; 7.62×39 bolts are available enough and you can easily stock a spare. Bullet and ammo selection, well I’m sure everyone reading this can agree, you are not as likely running to your local Folly-World and picking up a box of either like you can an ’06 or 30-30. Still, the Grendel is on the shorter end of the stick in offerings and availability. How significant of a problem? Well, not much to anyone with a brain who doesn’t wait to the night before opening day to dust off the rifle and find they have little or no ammo. To a hand loader, no problem at all – none. Forced in a pinch, the Grendel probably has an advantage providing you ever had to wildcat down brass from a parent cartridge. If that last line doesn’t make any sense to you – it’s advantage SPC. Accuracy? What does that mean? There are a myriad of factors that impact accuracy – too many really to do justice. But, if we are trying to split frogs hairs – each strength is its weakness. That same larger case that inclines the 6.5 Grendel more subject to breakage also results in more relative case volume. But what it gives, it also takes away too. 6.5 is smaller than 6.8. Therefore the Grendel has more bottleneck forcing the use of slower powders and longer barrels to burn it in. The SPC is not a neckless but can run less, faster, powders and use shorter barrels without serious degradation in performance. What does that mean? Well, it is easier to measure ‘more’ powder +/- 0.1 grain than ‘less’ powder +/- 0.1 grain (i.e. the smaller the charge, the more variance your practical +/- measurement becomes). But then there is also the powders’ characteristics in thermal performance, batch-to-batch. etc. And none of that – matters – if you don’t hand load. I’m back to 300+ yards or less threshold for decision making. I don’t believe 300 or less there is any practical ballistic advantage. As a hunter, I like most people, functionally hunt deer 100 yards or less. Yes, many people and states are flat, open over fields and just last season took 2 does at 180 and 189 – DRT. But nationwide – more deer and pigs are taken in brush and woods than across soybean fields. Y’all can argue about the veracity of that statement but it doesn’t matter, even if totally wrong. The 6.8 SPC functions in SBRs/pistols, in tactical length, in carbine and rifle & rifle+, oz equal pounds, pounds equal pain. And I feel, most folks using an AR platform firearm to hunt with, are doing so for the physical characteristics like being compact and light. The 6.8 SPC gives you options the Grendel can’t. In some ways over 300 yards, the Grendel may suffer less windage, etc. but with bullet choices, how is it’s terminal ballistics? I think you will find Bill Alexander isn’t at Alexander Arms. What is the future of the Grendel then? The Grendel is good. It excels over 300 yards but it just cannot compete with the versatility as an AR platform cartridge with the 6.8 SPC. In the tail end of 2-017, it is really is game-over for the Grendel if market share is any indicator. In fact you might want to get a Grendel while you can. While not quite a unicorn fart yet, they seem to me to be getting more expensive and harder to find. Sorry guys, I see a typo or two. Gabe posted in 2015 not 16. And just going to Midway USA (not a plug for Potterfield’s bunch) but go anywhere and look for ammo, uppers, whatever. Today after posting I looked Midway had 9 ammo offerings in 6.5 Grendel of which 3 were in stock, 2 of the 3 by Alexander Arms vs 24 different offerings for the 6.8 SPC 14 in stock. They sell out quickly, and Midway USA doesn’t have all of the ammo offerings available, and I haven’t found a site that does have them all. I was actually in the store today buying out all there 6.5 Grendel ( they only had 5 boxes Hornady black) and some other guy came in looking for the same thing, I handed him a few boxes because i was heading out of town in a few days to pick up some more anyways. Theres one thing none of you have discussed. The 6.8 was designed as a combat round not a hunting round, to be fired in a suppressed short barreled rifle. It took on the extra as a dear/hog gun. The 6.5 started out as a target round made from the old Russian round. People are trying to make it a combat round. You can make anything for both. Ever heard of a 30 herrett necked down to a 100 grain 24 caliber bullet. You’ve got a flat shooting low wind drift long range short round. Ive seen hodgy in afganistan hit a gi in the helmet at 800 yards with a world war 2 nosin nagant . What about the man behind each one of these rounds? Bottom line , in the right hands eather round will kill you. Heres another test for you sharpshooters out there. Set up a steel 8″ plate at 100 yards. install a Fostech echo 2 trigger in your 6.5 lower and 6.8 lower. Put 6 rounds in your magazines (both). Asuming both 16 inch rifles are zero at 100. Now no sandbags , no props of any kind ,just a prone lying position.By the way the 6.5 has 123 grain ammo and the 6.8 120 silverstate armory. Now use a timer and fire the rounds in 1 second to 1.5. Now go down and count the hits. Ive done this. the 6.8 will have more hits on the plates. All that presision fire in the 6.5 goes out the window because of recoll. When your lying on the ground ,its a 100 degrees.You have 3 feet of heat wave coming off the deck. Your wearing goggles, and theres a 6-8 mph wind with sand in it at 400-600 yards. your 5.56 with 62 grain boattails is drifting 2 feet at 500 yards. That 6.5 isn’t going to be any better than the 6.8. If you know your weapon and ammo your going to get a hit. Now its 10 minuets later and your going into a house and drop your night vision down because its dark in the house. Have any of you seen the muzzle blast on a 16 ” 6.5 Grendel in a closed room. Ill take the 6.8 . Don’t know why it doesn’t have as much muzzle blast. Bottom line both are great rounds and at the same time theres a lot better,and a lot worse. A ar-15 buff well call him bob was asked If you had to be stranded on a 300 yard desert island and had a choice of one gun what would it be? And he said an AK-47. If you have a steel bolt to chisel off you don’t use a wood chisel, theres a good chance it will ch;ip or break.No you use a steel chisel. Choose the right tool for the job and get proficient with it .IF you do that 2 more inches of drift at 600 yards will make no difference. Oh yes that Taliban I was talking about that hit the soilder at 800 yard was himself hit by a designated marksman shooting a big 30 caliber low sectional density 162 grain boat tail bullet. Guys don’t over complicate things. muzzle recoil can be almost negated with a proper muzzle brake or a heavy enough rifle. I run bipods on all my rifles. I don’t own an echo trigger, I don’t need to for my use. I don’t like the 6.8 purely because it was designed for combat, has similar starting ballistics as the 6.5 out of anything I can buy (20yr. old rn so nothing under 16″) and the 6.8 just falls so short of the 6.5 at distances I care about. As several have already pointed out, the original comparison in the article used low 6.8 SPC velocities. Perhaps they were velocities obtained in older, SAAMI spec chambers and not the SPC II chambers that have replaced them. The article is excellent otherwise and the writer did a good job in comparing and contrasting the two rounds. Nevertheless, accurate velocity data is crucial if one is to render an informed opinion. There is no lack of 6.8 SPC factory data out there, real data from many people chronographing an assortment of factory loads in various builds with different barrel lengths. These reveal the gist of what the author was conveying. That is, that within common hunting ranges the 6.8 SPC delivers more energy to quarry than the 6.5 Grendel while flying just as flat. Only at longer distances does the higher BC of the 6.5mm bullets make a difference. But using proper starting velocities is important to understand the real point a 6.5 trajectory overtakes a 6.8 and, more importantly, just how much more energy the 6.8 delivers within a few hundred yards than the 6.5. Rather than posting a lot of data let me just take a proper look 24″ barrel data using the same Hornady factory loads the author used. We can accept the 2700 fps value he uses for the 6.8 load in one of his comments above. Some people have been getting velocities a bit slower in their rifles, some have been getting velocities a bit faster. So, 2700 fps is a reasonable value. Once you run the numbers you will see the 6.8 starts with a noticable advantage and gives nothing up to the 6.5 until after 300 yards but the differences are not meaningful for a hunting cartridge. The gap widens at around 400 yards. That’s where the 6.5 begins to become a bit better at punching holes in paper. I say punching holes because neither is a great choice for huntint at 300 yards and both are a poor choice beyond. Even for target shooting any difference remains inconsequential until 600 yards. In fact, with a 200 yard zero, trajectories of the two remain less than 1″ apart until 600 yards where they finally separate by 2″. The 6.5 remains supersonic to 1000 yards while the 6.8 goes subsonic at 900. But even the 6.5 Grendel is not a competitor’s choice for long range shooting. That honor goes to rounds like the Creedmores, Norma BRs, and Lapuas. What does this mean? Well it dismisses the myth that 6.5 Grendel is any better than 6.8 SPC II in rifle length barrels, at least for any real world use or comparrison. What remains, what is no myth, is the ability of the 6.8 SPC II to ourperform the 6.5 Grendel in 18″ and shorter barrels, especially those 16″ and shorter. This is no suprise since the larger diameter of the Grendel case necessitates loading to lower pressures. Yes, the Grendel has more case capacity but it can’t let it’s boiler room run as hot as the 6.8 SCP can. Are they both great cartridges? Yes. Does one make one obsolete? No. Is one better for hunting in long, rifle length, barrels? Not at any reasonable hunting range. Is one better for hunting in short, carbine length barrels? The 6,8 SPC II absolutely is because that’s what the 6.8 SPC was designed for. Well, hunting of a sort, that is. Logan, you do realize, don’t you, the specifications in your links provide a comparison between the 6.8 SPC load from a 16″ barrel and the 6.5 Grendel load from a 24″ barrel. If you were to compare BOTH LOADS FROM 24″ BARRELS that 6.8 SPC load blows that 6.5 Grendel load out of the water all the way out to 500 yards! I was trying to avoid listing comparable ballistics but I guess I need to. Note the 6.8 load above would be considered adequate for elk to 240 yards (1506 ft lbs). It also carries 1000 ft lbs of energy to 510 yards (1001 ft lbs). Clearly, the 6.8 SPC load is the superior hunting load when compared to a similar 6.5 Grendel load. That Grendel load catches up to the 6.8 load at around 600 yards and then shows a slight advantage beyond. But any advantage the Grendel enjoys is not meaningful because 600 yards is beyond normal hunting ranges and because NEITHER is a serous 600+ yard cartridge for anything. In fact, with long barrels and high BC bullets (like the SST) both can shoot bullets that remain supersonic past 1000 yards. We already know the 6.8 SPC outperforms the 6.5 Grendel in short barrels. Few would dispute that. But we are told the 6.5 Grendel outperforms the 6.8 in 20″ and longer barrels and THAT IS A MYTH. We can see for ourselves that with similar loads and with equal barrel lengths the 6.8 SPC outperforms the 6.5 Grendel to 600 yards. Anything further is meaningless for either of these two rounds. Again, the 6.5 Grendel is a fine cartridge. They both are. But we cannot ignore the fact the 6.8 SPC is a superior hunting cartridge. That is, unless one is willing to accept comparing them as shot from different length barrels. The 6.8 SPC still comes up a superior hunting round but the differences are not as great as in the previous, erroneous comparison.. The 6,8 SPC with this load remains suitable for elk to 185 yards (1504 ft lbs) and delivers 1000 ft lbs energy to 460 yards. It is still supersonic beyond 1000 yards with 1260 fps remaining velocity. So, while the differences are not quite as great as previously posted, they remain substantial and the conclusions remain valid. In the fall of 2016, I took 4 feral hogs and 1 deer with a 6.8mm Rem SPC II chambered AR. Three of the pigs fell to a Sierra 90 grain HP. The doe and one pig fell to a Hornady 110 grain V-MAX. If the 6.5G is any better, I couldn’t stand it! LOL! Too bad we can’t post “pitchers”! I still have plenty blued steel and walnut in my safe, but 98% of my rifle hunting is with an AR. Ninety percent of that is with a Anderson “home build” in 6.8mm Rem SPC II. The 6.8 is a versatile round that performs better than the 6.5 in short carbine or PSD barrels and is competitive with the 6.5 in longer barrels. Operators like shorter rigs. Vehicle operators and tankers need compact arms. A 6.8 8.5” Barrel still spits out 90 grain bullets at 2450 FPS and a 16” pokes 2900 FPS. The 6.8 can burn most of its powder in these short barrels and still achieve impressive terminal performance, which leads me to vote for the 6.8 SPC ii being the best universal round for short barreled rifles and the longer Designated Marksman rifles — one caliber that fits multiple rifle configurations well. And, I’ve shot sub moa with a 10” barrel, and I can bang a 10” gong all day with my 8.5 inch 6.8 ii pistol using a red dot, while not shouldering the pistol . Abe great article, you’re right by the way. The 6.5 and 6.8 were both designed for different tasks, however they have more in common than people think. People will be people though and will argue over anything and everything. I personally chose the grendel due to the slight edge in performance at range. I ordered my upper through Alexander arms directly (as in the guy who created it) and have loved it. I wanted a load that would get me into shooting at distance and one that I could take to the field. The grendel did just that. I have been thinking about picking up a 6.8 just to do it(I am fond of LWRC Six 8 rifle). However, it is simply an idea I have since I already own and love my 6.5. Seeing as I already have a 6.8 spec which is my hog gun , I see no real advantage to building a 6.5 Grendel, thank you sir for your time on this article it helped me immensely, guess it’s onto a 6.5 creedmore or maybe a 450 ??? This makes me look at the 100 gr Wolf in a different light. I thought it was just cheap crap. When I got an early CZ 527 American (Rustic or something?) these wouldn’t chamber like they would in our AR due, I guess, to tight tolerances and that lacquer coating. 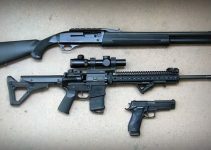 But love the bullet concept so I may stock a little in for the AR’s (we’re now a plural Grendel family). I have read this article multiple times over the years because I had picked up a 6.8 SPCII AR that I found to be an incredible deal, later I found a 6.5G that, for me was largely attractive for the generally longer range capability and the cost effective steel cased ammo options. I keep trying to tell myself that these calibers are so similar that I am being redundant in keeping them both. I also have 5.56 and 450B, and while those are such opposite sides of the spectrum, I keep thinking there is so much overlap between the functionalities of the 6.5/6.8. Maybe I won’t truly be able to appreciate the differences until I take up reloading maybe someday. In maybe what is considered naive theory, I have come to place the 450 and the 6.8SPC as two sides of the spectrum primarily for hunting calibers, both are shorter 16in barrels and simplistic, light setups. The 6.8 keep a bipod and probably too much scope for it, but it is is meant for quiet timed shots more so than anything rapid. The 450B works here in MI and can be used where rifles are no allowed, so it fills that niche. The 5.56 and 6.5G have lent themselves more so for the hypothetical SHTF/tactical scenarios, with the 6.5G leaning heavily towards the steel case increased power for the cost ratio, all while still being functionally accurate for anything in those ranges, and the 5.56 being generally ubiquitous. I have come to accept that realistically I don’t need any of them to be long range target rifles, bigger, better platforms exist. 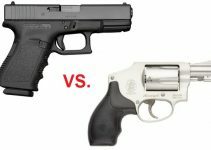 With these things in mind, I debate if I am differentiating them enough to truly justify keeping the calibers I have or if I should cull one and go in another direction. I greatly appreciate the comments posted, they really do keep this debate interesting as I sometimes wonder if I would have purchased the 6.8SPCII had I not found it first..
Any insights from anyone here on my thought process is greatly appreciated, Happy New Year and God Bless.